When boating in Delaware, you are required to have at least one U.S. Coast Guard approved Type I, II or III PFD or lifejacket for each person on board, regardless of the length of vessel. In addition, you must also have at least one U.S. Coast Guard approved Type IV PFD, either a ring buoy or seat cushion, if the vessel is 16 feet in length or greater. Anyone being towed behind a vessel is considered on board and must wear a PFD. All PWC occupants must be wearing a PFD while underway. Inflatable PFDs are not approved for children nor are they approved for use during high impact sports such as water skiing or operating a PWC. All boaters or passengers 12 years of age and younger must wear an approved Type I, II, III or V PFD at all times while the vessel is underway except when the child is below deck or in an enclosed cabin, or when the vessel is at anchor or moored. 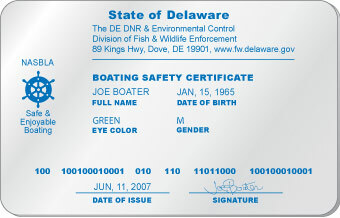 In Delaware, all boat operators born on or after January 1st, 1978 are required to complete a boating safety course approved by the Delaware Division of Fish and Wildlife and carry the resulting certificate of boating safety education at all times when operating. Any person with a valid Delaware River Captain's, Bay pilot's license or the equivalent is exempt. Persons must be at least 14 years of age to operate a personal watercraft. An adult must be o board when a 14 or 15 year old who has completed a boating safety course and holds a certification card is operating. PWC operators 16 years of age, who hold a boating safety education certificate, can operate without adult supervision. Boating under the influence, or BUI, is a serious offense in Delaware. It is illegal and dangerous to operate a vessel on state waters while under the influence of alcohol or drugs, or a combination of the two. Boaters are presumed to be under the influence of alcohol when the blood alcohol concentration is 0.08% or more, within 4 hours after the time in which the vessel was operated. For a 1st offence, violators face up to $1,000 in fines and up to 6 months imprisonment. For a 2nd offence, violators face up to $2,000 in fines and up to 18 months imprisonment. And for a 3rd offence, a violator is subject to a fine of up to $3,000 and up to 24 months imprisonment. Boaters convicted of BUI who are under 21 years of age may also face additional fines and mandatory completion of hours of public service. Operators on Delaware waters have given "implied" consent to a preliminary test of a breath and/or blood test to determine the concentration of alcohol or drugs in the body. If the test is refused, the operator’s boating privileges may be revoked for 1 year. The Delaware Division of Fish and Wildlife regulates the state boating laws in Delaware. Delaware law requires all motorboats, including those powered by electric motors, to be registered. As a boat owner, you are required to have a Certificate of Number, or Registration Card, and validation decals to operate your vessel legally on public waters. To obtain a Certificate of Number, submit the proper application and fee to a local Private Agent Location or visit the State Office. Once you receive the card, it must be signed and kept on board when the vessel is operated. Owners can choose to renew each year or every 3 years. The vessel is lost, stolen, destroyed, abandoned, or sold. With the Certificate of Number, you will also receive a registration number and validation decals for your vessel. Separated by letters with a space or a hyphen. For example: DE 1234 BX or DE-1234-BX. Under federal and state law, you are required to properly display the registration number and decals. Failure to comply with the correct documentation may result in delays and fines. And remember, it's important to keep your papers with the vessel and available for inspection by an enforcement officer when the vessel is underway. 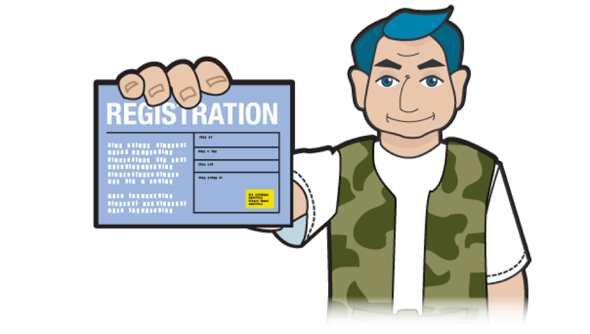 To find out more information about the registration requirements in Delaware, visit the Delaware Department of Natural Resources and Environmental Control, Division of Fish and Wildlife at www.dnrec.state.de.us or call 302-739-9916. Non-native aquatic species, plants, fish and animals are invading Delaware's waters. Hydrilla, Egeria Densa, water hyacinth and zebra mussels are nuisance species that can be accidentally transported by recreational boaters when caught in propellers, intakes or attached to hulls. These pests can increase dramatically under the right conditions, displacing native species, clogging waterways, and impacting navigation and recreation. Once introduced, they are nearly impossible to eliminate. Dispose on land into a garbage receptacle. Personal watercraft are very powerful for their size and demand the same respect as any boat. That’s why PWC operators must adhere to the same rules and regulations as any powerboat operator, including registering with the state and having a B-1 fire extinguisher onboard. There are also some additional requirements for operating a PWC in Delaware. Appropriate lights are required when operating after dark. The operator and all passengers of a PWC must be wearing a PFD at all times while underway. When towing someone behind the watercraft, the PWC must have the capacity to accommodate the operator, the observer and the person being towed. PWC operators must keep a distance of 100 feet from others being towed behind a vessel. PWCs may be operated at all hours of the day, but must be fitted with the required lights in order to operate between sunset and sunrise. PWC operators in Delaware must be at least 14 years old. PWC operators must have proof of successful completion of an approved Boating Safety Course in order to operate a PWC. Operators who are 14 and 15 years old are required to have an adult onboard. PWC operators 16 years of age, who hold a boating safety education certificate, can operate without adult supervision.